POPGUN 4 wins a Harvey Award! Posted on August 25, 2011 by D.J. This post is late. I should’ve gathered my thoughts and posted something by now, but the busy hasn’t stopped since the Baltimore Comic-Con. It was an amazing time, sharing a table with Adam P. Knave (who already posted this thoughts on the matter far more eloquently here) and meeting lots of swell people. 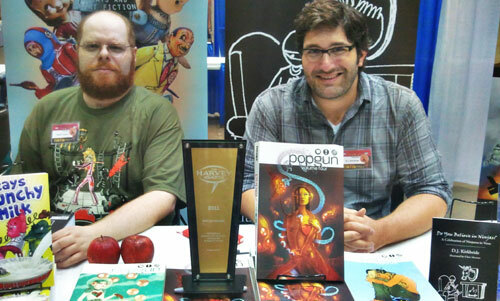 One of the highlights for me, of course, was POPGUN 4 winning the 2011 Harvey Award for Best Anthology! Adam and me, still in shock over the Harvey win. I’ve been working on the POPGUN books since volume 1. It was my break into comics, which had always been a dream, so I can’t thank Mark Andrew Smith and Joe Keatinge enough for the opportunity. Like all of the POPGUN books, POPGUN 4 was a labor of love. A very time consuming and sometimes difficult and worrisome labor of love, but there was always love. We all did it for the love of comics! Co-editing with Anthony Wu and Adam was a great collaboration, assembling a collection of stories that none of us would’ve put together individually. Thomas Mauer and Jeff Powell did amazing work on the production edits/design, and the book wouldn’t exist without them. Those guys… yep, those are good guys. And the contributors! We were able to assemble an amazing lineup of talent, and I want to thank all of them! So, thank you… Alison Acton, Attila Adorjany, Amanda Becker, Michael Birkhofer, John Bivens, Elliot Blake, David Brenion, Shana Brenion, Jeffrey Brown, Lars Brown, Antonio Campo, Dominique Carrier, Jim Charalampidis, David Collinson, Bill Crabtree, Dave Curd, Michelle Davies, Vito Delsante, Todd Dezago, Michael Dialynas, Jeik Dion, Becky Dreistadt, Alex Eckman-Lawn, Nick Edwards, Paolo Ferrante, Jess Fink, Joe Flood, Fonografiks, Elizabeth Genco, Frank Gibson, Vassilis Gogtzilas, Nils Hamm, Mike Houlihan, Alice Hunt, Meg Hunt, Jason Ibarra, Fernanda Jaber, Jock, Andrea Kalfas, Janet Kim, Nikos Koutsis, Erik Larsen, Erwin Ledford, Stuart Livingston, Maximo V. Lorenzo, Robert Love, Adam Lucas, Manoel Magalhães, John Malloy, Fell Martins, Derek McCulloch, Michael Meier, MJ, Chris Moreno, Wayne Nichols, Ralph Niese, JM Ken Niimura, Kieran Oats, Anthony Peruzzo, Elton Pruitt, Stephanie Ramirez, Darren Rawlings, Stephen Reedy, Andy Ristaino, Salgood Sam, Eric Sandhop, Matteo Scalera, Thomas Scioli, Brandon Seifert, Jonathan Silvestre, Frank Stockton, Nick Tapalansky, Ben Templesmith, Jeremy Tinder, Mike Toris, Osmarco Valladão, David Walker, Angie Wang, Matthew Weldon, Anna Wieszczyk, Brian Winkeler, Michael Woods, K.I. Zachopoulos, Alexis Ziritt! Big thanks, of course, to Image Comics, for publishing four giant POPGUN books so far… wow! They all obviously love comics, too, and it’s much appreciated. In the end, it was an honor to be nominated and a huge, delightful surprise to win. 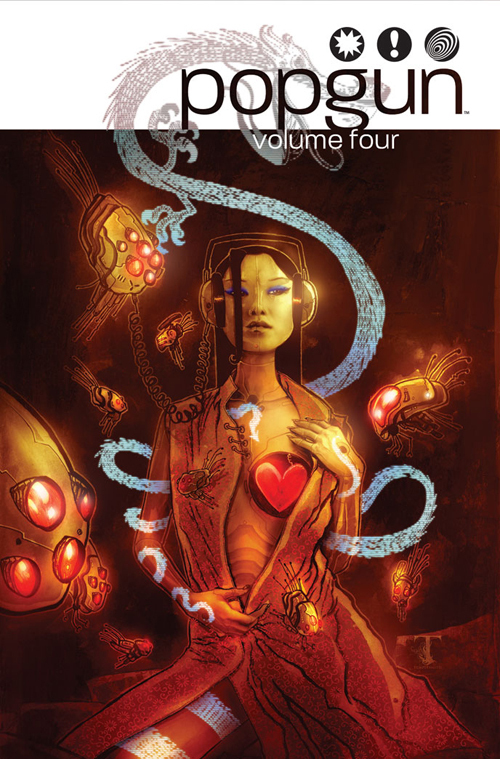 My hope is a few folks who normally wouldn’t have read the book will now check out POPGUN 4. And now… time to make MORE comics! Posted on August 15, 2011 by D.J. For your information, I will be sharing table 1710K with my esteemed and bearded co-writer/bff Adam P. Knave at this year’s Baltimore Comic-Con! If you happen to be in Baltimore August 20 or August 21, please stop by our table for book signing and chatting and whatnot! We’ll have copies of the POPGUN books! Adam will be selling his terrific novel STAYS CRUNCHY IN MILK and his hilarious book of essays I SLEPT WITH YOUR IMAGINARY FRIEND! And I’ll have some of those silly DO YOU BELIEVE IN NINJAS? poetry books! Oh, and we’ll have a special, discounted, 100 copy run of our one-shot comic AGENTS OF THE W.T.F.! It features stories that appeared in POPGUN 3 and 4, plus some bonus coolness. Really, to be perfectly honest, it’s going to be the best time. Posted on August 9, 2011 by D.J. No more word for now, but if you’re at the Baltimore Comic-Con, we’ll all be there with some more sneak peeks… !